Anything containing the words “the most” in it is usually something that I’m interested in. For example if you were to tell me of a place with “the most beautiful girls” or “the most delicious beer” I would most certainly take your advice seriously. 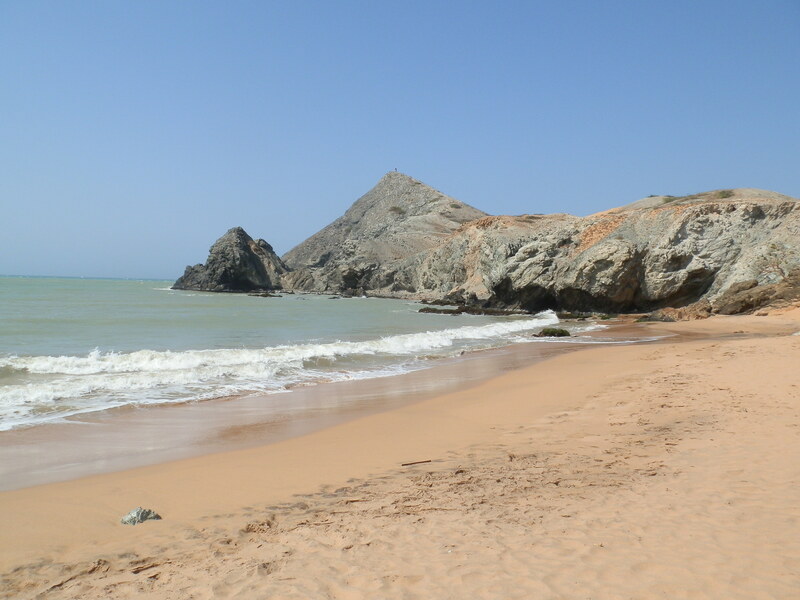 For this reason when a friendly Colombian girl told me about the Guajira Peninsula, a.k.a. the most northern point in South America I knew that it was a place that I must find. Not only did the simple idea of being at the absolute northern point of a continent intrigue me, but the way in which I was given the advice on how to get there was equally as interesting. We were given a series of small towns to travel to en route to this enchanting peninsula known for dry, red deserts that stretch out to a contrastingly blue sea. 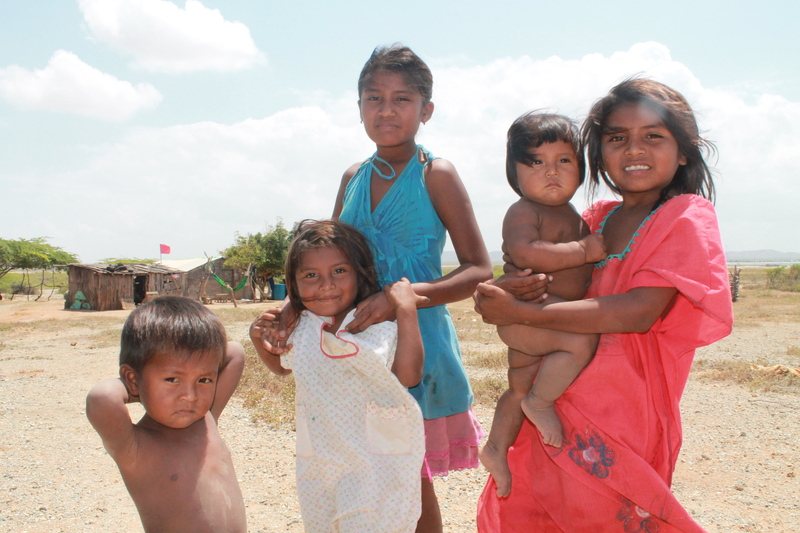 We were told we needed to take varied forms of transport from buses, taxis and even sitting in the back of trucks with goats and the local Wayuu indigenous people. With no real expectations we set off on an adventure of the purest nature. My travel partner and I had a German girl (quite possibly the girl from the movie Run Lola Run) join us and we woke up early to catch the first bus. Bright and early we set off from Santa Marta on what turned out to be a 10 hour journey. After a taxi, bus and what seemed to be some random guy’s car we found ourselves on a straight dusty road alongside an old railroad track and a line of trees that looked like they had been decorated for Christmas they had so much trash clinging to their branches. As we raced up behind a truck crammed full of locals and food, Anna (German Girl aka Lola) jokingly said that truck would probably be our next form of transportation. Funny enough we actually pulled alongside the vehicle, stopped them, and our driver told us to squeeze into the truck bed, as this was the normal transport to get us to the peninsula. We stopped in a local market to cram even more supplies and people into this small truck, while trying to enjoy a lunch of the local delicacy; fried goat meat. 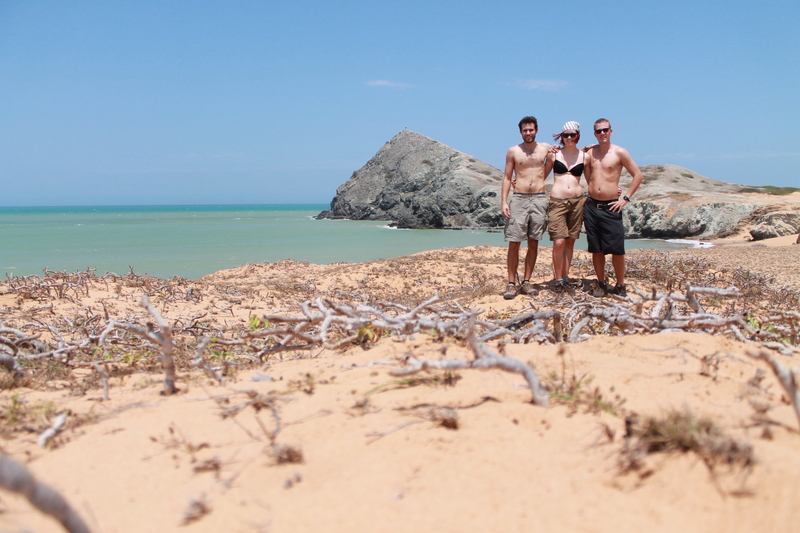 After a few more bumpy, dusty and uncomfortable hours we made our way to Cabo de la Vela, a small town and strange landscape of desert shrubs and cacti leading right up to the ocean. Just before the sun dipped below the horizon we managed to rent a tiny wooden shack to hang up our hammocks for the night. We managed to find a local Wayuu woman’s restaurant nearby who was serving some shrimp and rice to a group of Colombian University students and teachers who had come to study the stars. The food was not the greatest I’ve ever put in my body, but the astronomy teacher was jazzed to point out all the constellations with a crazy high powered laser for us after the meal. Being in a desert with virtually no lights and so near to the equator that we could see constellations from both hemispheres made for quite an amazing place to gaze upon some stars. 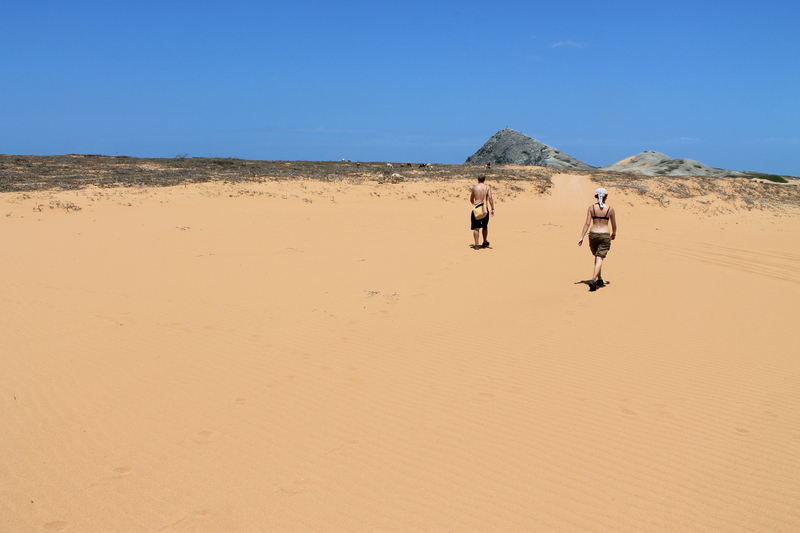 The next morning we set out to trek across the desert to a small mountain and beach where we could hang out on the true end of the continent. A hot, sweaty but amazing journey through a desert full of lizards, vultures, goats and some of the tiniest communities of people living on literally the most basic necessities of life I’ve ever come across. Tiny shacks with nothing more than a couple wood logs to hang hammocks and a sheet to provide some shade from the abusive sun, these indigenous folks were some serious roughnecks living in the most unlivable landscape imaginable. All the women had their faces painted black and did not want to be photographed. After hours of trudging through sand amongst the goats we came across Pilon de Azucal, an incredible little mountain at the end of the world. We quickly made our way up the mountain for one of the most unique views I’ve ever laid eyes on. Red sand cliffs slowly eroding into an aqua-marine sea that stretched on as far as the eye can see in both directions, the landscape was definitely worth the long and difficult journey. After quite some time enjoying life at the end of a continent we made our way to an amazing little secluded beach where it felt like we were the only people in the world. As midday turned to afternoon we decided to trek back to our shack, but not before we bought some Venezuelan beers from some local Wayuu’s. Sunburned skin, tired legs, but an amazing feeling of achievement for having experienced such an amazing place, I took a refreshing siesta in a hammock and awoke just in time for a nice sunset. We bought some disgusting local homemade liquor (that we later found out is often used for cleaning supplies) from a child and her mom then had some dinner. 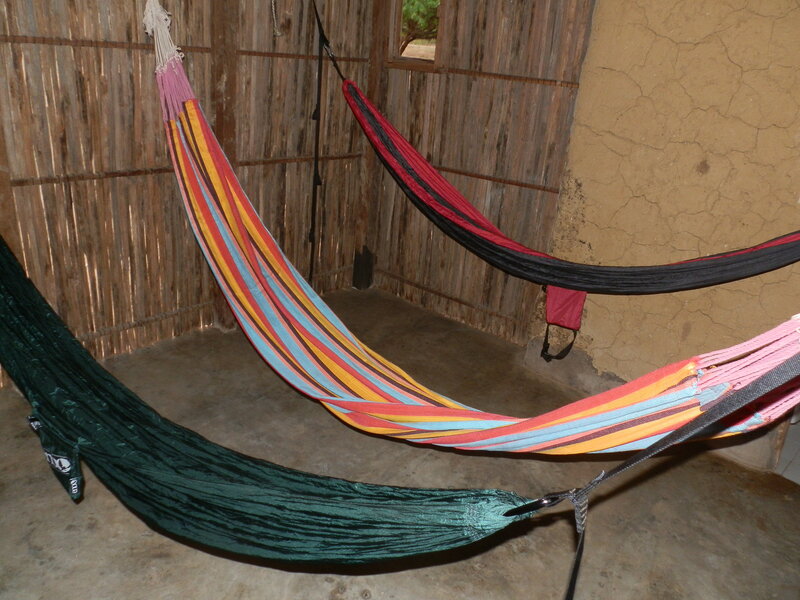 Fairly exhausted we headed back to our shack to lie in hammocks, wincing as we sipped the gross alcohol and talked about the differences between German and American dating culture. The next morning a truck came to take us back to civilization at a bleary-eyed 5am. Along with a couple other German backpackers and locals there was a man who when approaching our vehicle seemed to let out a blood curdling scream. I was confused for a moment until I saw that he was lifting a live goat into our truck bed and that sound of a child being tortured was just the animal not the man. As I tried to get comfortable smashed into a little corner of a truck with a goat at my feet speeding through an open desert I had a brief realization of how wild and awesome this adventure truly was…. 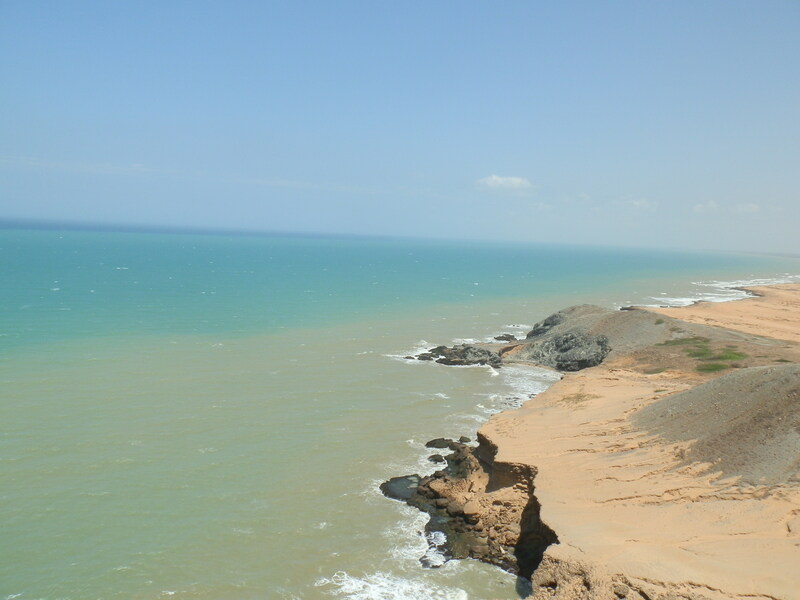 This entry was posted in Colombia, South America and tagged Adventure, cabo de la vela, Colombia, guajira, most northern point sou, most northern point south america, punta gallinas, Travel by verenico. Bookmark the permalink.